January 4, 2018, 8:16 PM · The San Antonio Symphony's 72 full-time musicians will be unemployed Sunday after the remainder of the orchestra's season was canceled abruptly after a meeting between Symphony management and the musicians' union on Wednesday. 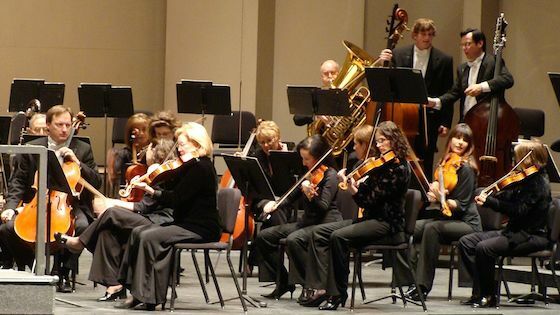 Besides the musicians, the symphony employs 11 operations staff members. The symphony's season will end at midnight Sunday, after Friday and Saturday performances for the city of San Antonio's Tricentennial Festival. Members of the San Antonio Symphony before a 2009 concert. "To be treated in this manner, to put the musicians at such hardship as this, out of work after so many promises, is absolutely disgusting," said Craig Sorgi in the San Antonio Express. Sorgi is a violinist and negotiating chairman of the Musicians of the San Antonio Symphony. "It’s just incredibly disappointing for the San Antonio Symphony and for the city of San Antonio." According to multiple news sources, a newly formed nonprofit called "Symphonic Music for San Antonio," funded by San Antonio supermarket chain H-E-B, the Tobin Endowment and the Kronkosky Charitable Foundation, had been set up in July to take over the symphony’s assets and operations from the Symphony Society of San Antonio, but the new organization backed out of the deal in December. Symphonic Music for San Antonio Chairman Bruce Bugg Jr. appeared to blame the AFM's troubled pension fund for an "underfunded pension obligation of more than $4 million" that killed the deal, though the AFM's Pension Plan is a completely separate fund from any symphony operations. The $4 million appears to be a potential withdrawal liability that would be charged by the ATM should the SMSA pull out from the musicians' pension plan. But there would be no liability should the symphony continue to contribute to the plan as it has in the past, according to a statement from the Musicians of the San Antonio Symphony. After "Symphonic Music for San Antonio" backed out, the San Antonio Symphony Society resumed responsibility for the orchestra. Wednesday's decision to suspend the season happened in the midst of contentious contract negotiations between the musicians and symphony management. The previous union contract expired Dec. 31. The symphony is offering refunds to ticket-holders for shows scheduled after this weekend's performances. January 5, 2018 at 07:32 AM · Here is a very, very interesting article, looking into J. Bruce Bugg, Jr., by longtime V.com member Emily Hogstad in her blog, Song of the Lark. January 5, 2018 at 03:21 PM · Oh my goodness. This is abiolutely brutal! Why in the world would they do this? January 5, 2018 at 03:29 PM · The question is, what happened to their pension $$? Maybe management "borrowed" from it during the recession and never put it back? January 5, 2018 at 05:03 PM · Here is another story, A Timeline of Symphony Struggle: Springtime Hope, ‘Iceberg’ in Winter from the Rivard Report. It does a good job of explaining the falsehood statements made about pension liabilities and also is followed by some interesting comments. January 5, 2018 at 05:35 PM · The pension fund is separate, true. But everyone knows it is a requirement per the master agreement for management to contribute to it with funds raised by the board. The true condition of that fund was obfuscated before the new donors stepped in. They could certainly continue to contribute, but the new donors would take responsibility for the unfunded liabilities. They do not want to do that, plain and simple. And who would? There is hardly an endowment, and years of financial mismanagement have resulted in this. I want to see this orchestra thrive, I truly do, and what is happening is terrible. But the time has come for management and musicians to stop kicking the can down the road and deal with this. I hope and pray they can reach resolution soon. January 5, 2018 at 06:30 PM · Come to Naples, Florida! The philharmonic needs you! January 5, 2018 at 07:45 PM · Mary Ellen Goree, whose comments on the Violinist.com discussion board always seem to be highly respected and appreciated, is the Principal Second Violinist of the San Antonio Symphony, so this awful situation affects our community here as well. January 5, 2018 at 10:14 PM · A sad story about how the citizens of this nation view "The Arts." Of course part of the problem is the pension fund and the managers of the fund. This isn't limited to musicians, the managers of pension funds project annual earnings of about eight percent. Actually quite unrealistic in a time when the US Treasury is paying less than one percent. That means that the fund managers, who also charge hefty fees regardless of the actual performance of the fund wind up in high-risk investments that often crash-and-burn leaving the fund worse off than it was before the investment. Chances are that the national pension will wind up being taken over by the Pension Guarantee Corporation which will seize the assets and make payments on the actual value of the fund which they will manage using very conservative investments. I'm sad for all the musicians and their families as well as the community that won't have the performances and all that they bring to the larger community. January 5, 2018 at 10:18 PM · It's sad that the season got cancelled suddenly -- it certainly doesn't help the performers, staff, venue, or audience. I used to subscribe to a few different series at a local venue, but after a year when they suddenly cancelled performances, I didn't. January 5, 2018 at 10:56 PM · Very sad. But reason 1,000,007 why musicians should learn as much as they can about finance and investments. Hard to understand why San Antonio's endowment seems to have done so badly at a time of stock market boom. January 6, 2018 at 04:52 AM · Sad news. My husband and I will be visiting San Antonio -- and Texas -- for the first time in March, and I was very excited about our tickets to a performance at the Majestic. Our money already has been refunded by Ticketmaster (which is how we learned the show was canceled). I'd much rather have the experience. January 6, 2018 at 06:54 AM · My heart goes out to all the musicians affected by this, but especially to Mary. I hope there is a way that this can be resolved. January 6, 2018 at 02:53 PM · Sounds to me as though the management finally had enough of the union's extortion. January 6, 2018 at 08:17 PM · Some good news. The season will resume was announced at Friday's concert. The old symphony board has been installed and is attempting to salvage as much of the remaining concerts as possible. It will be a challenge but new money is coming in. January 6, 2018 at 08:43 PM · It is vey sad news, when an professional orchestra is in trouble, the whole community is poorer. I would not be so quick to blame bankers and fund managers. Given the performance of the market in recent years, 8% is not unrealistic. The unfunded liablity could stem from a very low level of contribution to the pension fund. January 12, 2018 at 01:56 AM · Too sad, despondantto say anything.